To the fascinating Museum of Water today, where visitors donate vials of water, usually with a story attached, for public display. My favourite was probably the “condensation” (gob) emptied from brass instruments after a concert. Samara and I made a donation (water from a little canal that runs alongside part of the River Kelvin in Glasgow) and were interviewed by a performer/attendant called Mary. She asked how we met, which brought us onto New Escapologist. She said that a previous museum visitor had been talking about flying fish and how their flight is a mode of escape. Apparently they have trouble with boats and tend to fly right into them, either smacking into the bulkhead or landing (and dying) on the deck. Isn’t that sad? 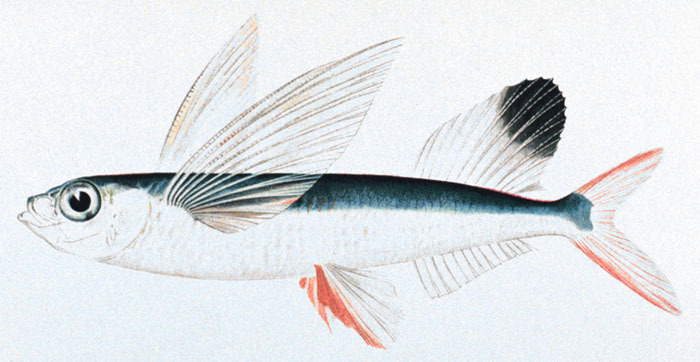 In the natural state, the flight of the flying fish is probably a perfectly good means of escape from predators. Only the unnatural addition of boats to their world has made it futile. We all agreed this was a fitting metaphor, and that Escapologists will come across our equivalent of seafaring boats: immovable obstacles (bureaucracies, usually) that will scupper escape. Doesn’t mean we shouldn’t try though, does it? Let’s feel the wind beneath our fishy fin-wings! Bugger the boats! At least we’ll have tasted the thrill of flight! My recurrent line about how Escapologists, if forced to return to office life, “will at least have something to talk about at the water cooler” brought our conversation neatly back to H2O. So let’s adopt the flying fish as the Escapological totem animal. Let’s work it into our coat of arms. (Or fins).